Welcome back to the NBA Star Power Index -- a weekly gauge of the players who are most controlling the buzz around the league. Reminder: Inclusion on this list isn't necessarily a good thing. It simply means that you're capturing the NBA world's attention. Also, this is not a ranking. The players listed are in no particular order as it pertains to the buzz they're generating. This column will run every week through the end of the regular season. That's a 7-footer doing that to Giannis, who will be, or should be, in the conversation for Defensive Player of the Year. That is not normal. Embiid's name has gotten pretty buried in the MVP race, which is essentially down to two candidates in Giannis and James Harden, but Embiid's plus-10.5 net rating is better than Giannis' (plus-9.7) and way better than Harden's (plus-0.6). The Sixers, who are actually a better and more efficient team, statistically speaking, with Ben Simmons on the bench, indeed get significantly worse both offensively and defensively when Embiid is off the floor. He's the MVP of that team and one of the four or five most valuable players in the league. As mentioned above, Giannis went nuts against the Sixers -- albeit in a loss -- for 52 points, 16 rebounds, seven assists, two steals and a block. The game before that -- in a win over Miami -- he went for 33 points, 16 rebounds, nine assists, three blocks and two steals. With Milwaukee streaking toward the best record in the league, one year after losing in the first round and without having made a single All-Star roster addition, The Freak's MVP case is getting harder and harder to deny. "He has to be at the top of that race, in my opinion," Malcolm Brogdon recently told CBS Sports. "To me it's simple: The jump this team has made -- yeah, we've put the right pieces around Giannis and guys have gotten better, Bud's system has really fit us, but it's largely about Giannis and his growth into basically a top-three NBA player. Value wise, like I said, he's taken us to a level where we don't feel like there's a ceiling on us. We feel like we can go all the way." "Giannis' individual play speaks for itself," coach Mike Budenholzer said. "But what he's done for our team, how things have changed here, the leap we've taken, I think that's an MVP season. That's an MVP statement for the kind of change he's brought." In talking to a handful of scouts, the consensus is that the Bucks would be a super long shot to beat the Warriors if they were to make it to the Finals. But, yes, Milwaukee has every right to consider itself the cream of the East. The Bucks' status as the No. 1 seed would appear to make that an obvious statement. However, at least one Western Conference scout still has reservations about fully believing in the Bucks because he feels teams will "wall off" Giannis and frustrate him over a seven-game series, making his inability to shoot from the outside all the more problematic. Indeed, there is a history of non-shooters being schemed out of playoff series, or at least exposed to a degree which their team ultimately can't overcome. Just look at Ben Simmons last year vs. Boston. But an Eastern Conference scout recently told CBS Sports, in essence, Ben Simmons is not Giannis Antetokounmpo. Nobody is, really. The rules are different for him. "The short answer is, Giannis is just that good," the scout said. "They have a lot of shooting around him and they're so balanced. If people are worried about Giannis' shooting, I think that's overblown." 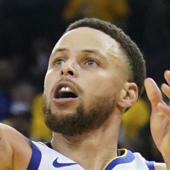 After leading the Warriors to wins over Houston and OKC with Kevin Durant sidelined, Curry had himself a bit of a Curry flurry in a win over the Wolves on Tuesday, turning a cold shooting start into a red-hot third quarter en route to 36 points on 8 of 14 from 3-point range. Seriously, is there anything in the basketball universe better than Stephen Curry highlights? This is more than just a fun highlight. It speaks to so much of what makes Curry great. Most NBA players won't take long-range, end-of-quarter heaves even when they are shooting well, because they're too concerned about their shooting percentage. They either strategically wait until just after the buzzer sounds to launch the shot, or they just flat-out dribble the clock out. When they're already having a bad night, forget about it. No way are they going to further plummet an already dismal shooting percentage. Curry, on the other hand, launches these shots without fear. Every single time he has an opportunity, unconcerned with his shooting stats because he knows he's the best shooter in history regardless of his shooting percentage at a given point in time. Again, this honestly says more about Curry and the confidence and free mind he plays with than any of his "normal" highlights. It also allows for things like this to happen every now and again. Russell made his first All-Star Game in February and he's had two 40-point games in the three weeks since -- the most recent being a 44-point effort that included 27 fourth-quarter points to fuel a 25-point Nets comeback win over the Kings. The Nets trailed by 25 points entering the 4th quarter, but they outscored the Kings 45-18 the rest of the way to win 123-121. D'Angelo Russell had 27 points in the quarter. The Nets have a decision to make on Russell, who'll be a free agent this summer. For some time, there was some debate as to whether he'll end up being worth the money he'll no doubt be looking to land and will likely attract from someone. That doubt is disappearing pretty rapidly.